INDIANAPOLIS — Baby Amiah Robertson has been missing for seven days. As police continue their search, family friends are desperate for answers. "I want the truth on that baby," Clyde McPeak, who lives with the uncle of 8-month-old Amiah. "We’ve been trying to go to the scene and find out what we can," McPeak said." Ever since baby Amiah went missing, they've been trying to figure out what happened. Investigators continued their search in a field near South Belmont Avenue on West McCarty Street, near Eagle Creek. McPeak was there. "Everybody started leaving, then the mom and dad pulls up laughing and asking us if we’re all right," McPeak said. He said baby Amiah's parents were at the scene too. "That’s not the way I’d be feeling if my kid was missing by any means," McPeak said. "There wasn’t no tears in her eyes looking for her baby." The search continued Thursday as investigators flew a drone around Eagle Creek. Law enforcement sources close to the investigation have told RTV6 that based on information following Wednesday's search, investigators are going back to the site and expanding their search in the area to exhaust all possible leads. "Somebody knows something, but they’re not telling the whole truth about it," McPeak said. 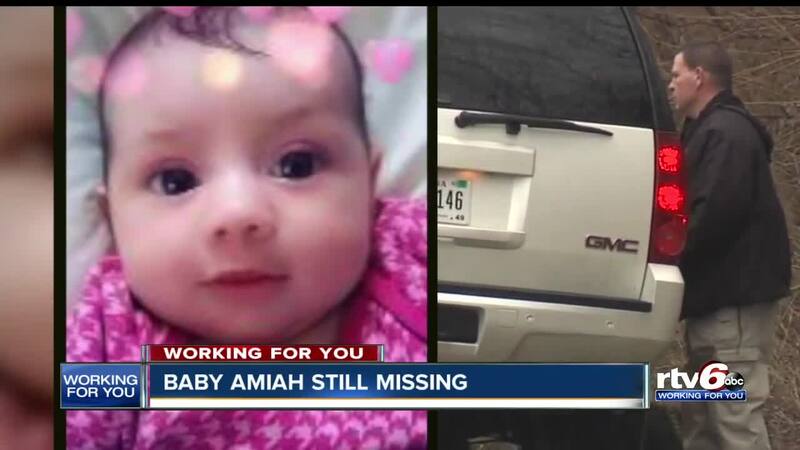 Baby Amiah went missing last Thursday and was reported missing on Saturday. "You don’t wait two days; I don’t care who ya are," the family friend said. McPeak is focused on justice. "Catch that dirty person that done it and make 'em pay." IMPD Missing Person Detectives are still seeking the public's assistance in locating the missing baby. Anyone with information about Amiah's disappearance should contact IMPD Missing Persons at 317-327-6160, 317-327-3811 or Crime Stoppers of Central Indiana at 317-262-8477.